I have a lot of pictures and will explain each of them briefly in the caption. I also tried to include a link to anything I found on Teachers Pay Teachers in case you would like to use the resource in your classroom! This is where I write the daily plans. 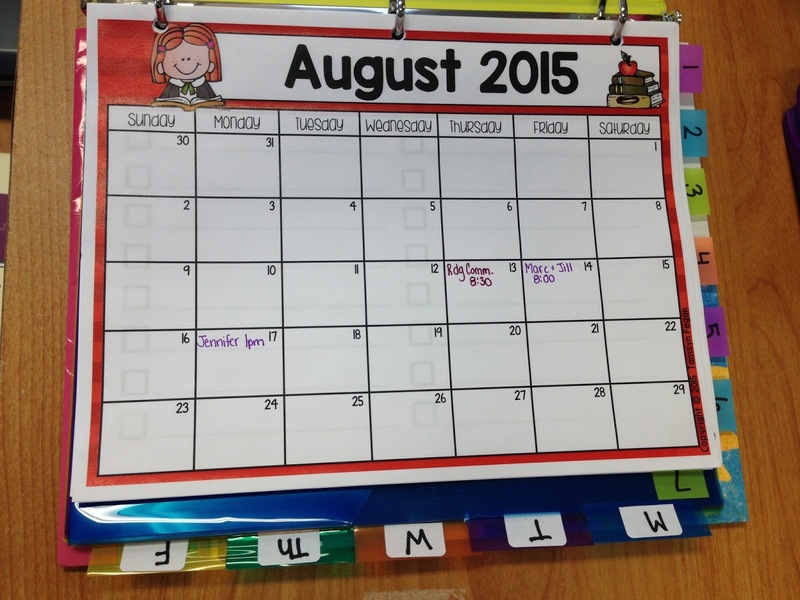 The yellow blocks are times when the students are in Specials. 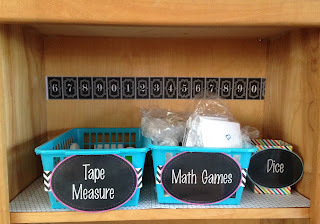 The blue strips are when we are outside for recess and/or snack. I did this last year and it was awesome! I have a folder for each day where I store the copies for that day's lessons. 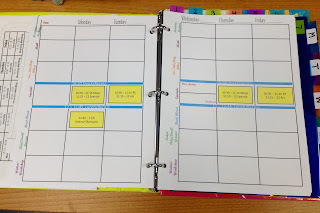 This is behind my weekly planning pages. Behind the daily handout folders, I have the rest of the year's calendars. This is the view when you walk in from the front door. To the left of the front door. I tried to set up two separate areas. One for when we are working on the carpet with mini-lessons, read alouds, etc and one area for whole class direct instruction while students are at their desks. I have so much space now that our desktop computers were replaced with chomebooks (yay!) and I wanted to utilize it all as best I could. Last year, my colors were blue, black and green. I added pink this year! That rocking chair was a $20 find on Craigslist. I started out by spray painting it, but that didn't work, so I ended up buying high gloss pink paint and just doing it with a paintbrush. I am so excited to use it this year! After I brought it home, I realized it is even more perfect because it is low to the ground, unlike the regular chairs I have been using the past 2 years. I apologize for this being so dark because of the window there, but I wanted to show you this great idea I found in Education to the Core's TpT store for FREE. At the end of the day, after students have packed up and brought their bags to the carpet, I will ask for them to take a post-it and write what they thought was most fun, inspiring, exciting, confusing, etc. from the day. I plan to have them share with the class as our Closing Meeting. The sharing won't happen everyday, but I do want them to participate in writing something each day. The Information Board! 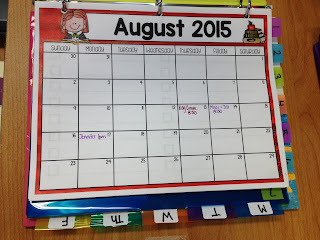 I will write homework there, place the students in groups for the day or week. Unfinished Work: The binder is filled with pocket dividers. 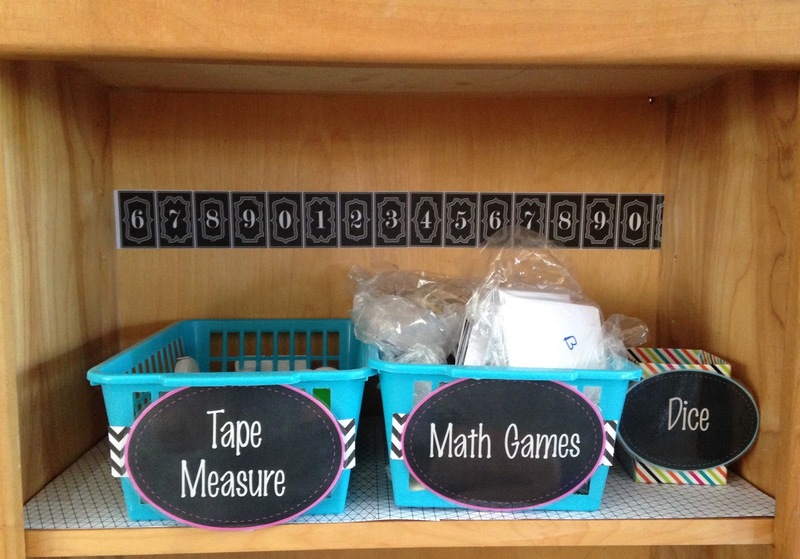 Each divider has a student name on it. 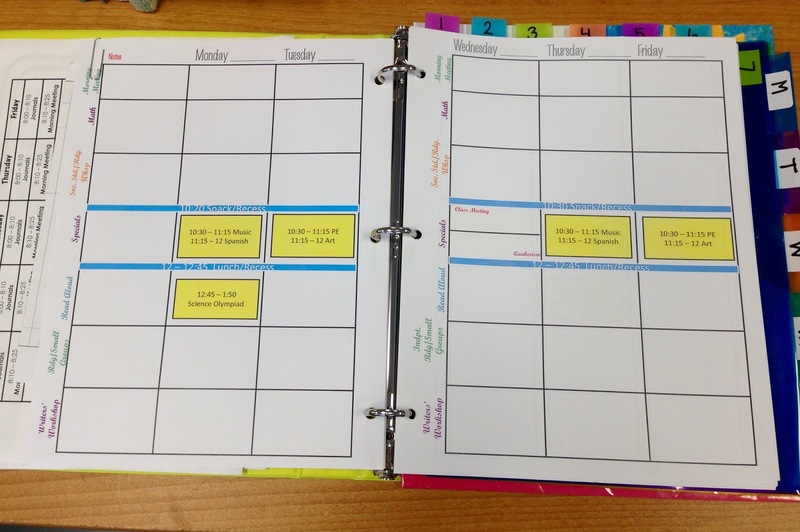 If students do not finish their work during the allotted time, they will place it in their folder in this binder which is labeled "Unfinished Work". The pink basket has each hanging folder labeled with their names. This is essentially their mailbox. I place anything that needs to go home in there. They will go to their file before they pack up at the end of the day. 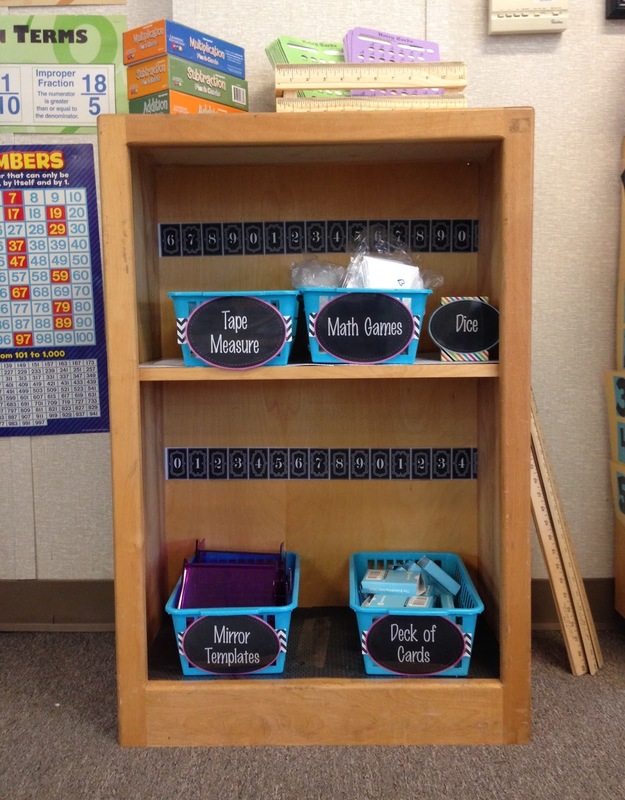 Math supplies are stored in this cart. I have the document camera there as well. The pencils on the board is the schedule for the day. I do not include times in the schedule because it is never a set time for anything and that gives me more freedom when lessons need to be extended or cut short. The calendar was made with paint samples from Walmart, a black poster board and then laminated. New this year are the pink tubs and the decoration on top of the middle shelf. That wasn't planned. I had the tissue paper things hanging from the ceiling, but I didn't like how that looked (after spending a good 30 minutes putting them up around the room). The blue box was extra and so I decided to make a little decoration out of them. I have 3 boxes like that placed around the room. I bought the book stands at Hobby Lobby for about $3 each and then found them at the Dollar Tree after I removed the price tags and thew them out! Book Hospital that I still haven't performed surgery on since last year. I am thinking about asking a student to take care of that this year. In addition to the Sticker System, I am implementing this procedure for checking out books. I hope for two outcomes with this system: 1. Books will be returned and not go missing. 2. Students will feel more (and be held more) accountable for finishing books or at least put more thought into abandoning a book before they actually give up on it. During the first week of school, students will help complete this board. I got the shelf and boxes from Walmart. The squares on the board are 12x12 pieces of scrapbook paper. This is the third year I will have students keep track of where they are in the writing process during our different units. I found this on the Creative Chalkboard website and love it! I typed each student name on the mini-pencils, printed and then laminated them. I hot glued magnets on the back of the pencils so students can easily move from one step to the next. The pans are from The Dollar Tree. I glued thumbtacks to the back of those and stuck them into the wall. Math Supplies. I found that awesome ruler box at Michael's Craft Store. I ended up using scrapbook paper to line the shelves and some of the pieces had numbers, so I trimmed those to make the border in the back. The place mats are going to act as whiteboards. We will see how dirty it makes the table and if it actually works long term to constantly be writing and erasing before I decide if this is a good idea or not. The shelf behind my chair. I have the materials for when I meet with small groups for Reading along with extra pencils and erasers. These are old pencils from last year. Each group has a different color folder. They are plastic with tabs to insert papers. I am using these for the Interactive Notebook which I purchased and used last year. My desk. The sign on the front was something a found a few years ago on Pinterest and absolutely love. I think it is really important to remind students that I am on their side and care about them. This is an area to the right of my desk. I have books and supplies for the first unit stored there. The basket holds my record and assignment books. Shelf from Walmart flowers from The Dollar Tree. 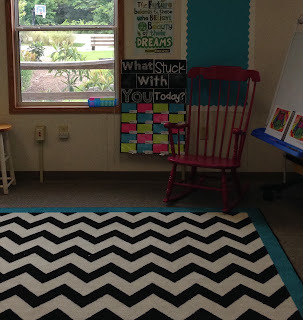 And that concludes my Classroom Reveal! I hope you enjoyed it and were inspired as I was when looking through others' reveals! Happy New School Year! !